I hope you enjoyed reading this guide as much as I enjoyed writing it. If you have found this guide to be useful, please help me in promoting it. I would be grateful if you can share this guide with other travelers, post it on Reddit, Facebook and other social media, blog about it or just link to this website. I welcome you to reach out to me via e-mail or leave a comment if you have any questions or feedback so that I can continue to improve this guide over time. Despite some of my gripes about the New York subway, I do think it's one of the best subway systems in the world. It certainly provides the most bang for your buck. It's impossible to think of New York City without picturing the subway. The subway system brings a lot of jobs to the city, and is the one place where you encounter people of all races, ethnicities, genders, types, and income brackets. New York wouldn't be this great of a city were it not for its subway system. The most convenient, cost-effective way to travel in New York City is by subway, but many first-time visitors, tourists, and even locals find the complexity of the system intimidating and confusing. 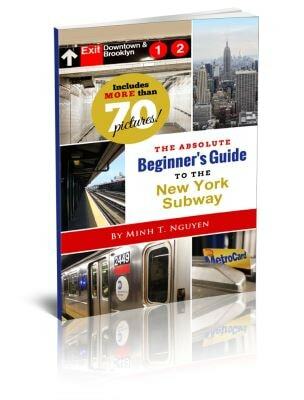 Whether you are a first-time visitor or have struggled to use the subway system in the past, this guide is for you! This book makes absolutely no assumptions about what you know about taking public transportation in New York or elsewhere. Illustrated with more than 70 pictures and figures, this detailed guide breaks down everything you need to know about using the subway - from the ground up. You'll learn how to read the subway map, properly differentiate between the many subway lines, and identify the correct trains and platforms. Filled with detailed information and many pictures, this guide will alleviate your fear and confusion about taking the subway and allow you to navigate it confidently and effectively so that you can focus on enjoying New York City.